Don’t call it a comeback, but Cincinnati, OH alt-rock mainstays the Afghan Whigs brought their arena-sized rock show to the intimate Doug Fir Lounge yesterday, on the eve of the release of Do to the Beast—the group’s first new album in sixteen years. This dichotomy has been greeted in the past with mixed results; 90’s Irish power poppy trio Ash performed in Portland for the first time in over a decade at the same venue in January and the outcome was less than overwhelming (maybe due to lighter attendance.) The Whigs, however, sold out the 300-some capacity venue and made you believe the space they were playing in was much larger—probably because the spirit of the band and frontman Greg Dulli’s charisma and sincerity really was a bit larger than life. That said, there was no shortage of talent on stage that night: openers Early Winters featured renowned English vocalist Carina Round, who sings dual lead vocals in the group with frontman Justin Rutledge. Their music can best be described as a sort of Indie Americana, with more of an emphasis on the latter; swelling vocal prowess, tranquil tempos, warmly welcoming delivery and wintry images conjured by the instrumentation. We may officially be in Spring, but Early Winters’ music may as well have been the soundtrack to Portland’s climate lately, never letting go of the cold weather—not to mention being held in high regard by Pink Martini’s China Forbes, who was in the audience. The venue also proved a perfect fit for the quartet (rounded out by Dan Burns and Zac Rae), and one should hope to catch the group next time around in a small venue while they still can. Following a half hour wait, the Afghan Whigs tread onto the darkened stage and launched into new album opener “Parked Outside:—amidst a stage show noticeably amped up from Doug Fir’s usual jaunt, introducing more lights & smoke than the venue typically has. They even had a well-appointed silky rug comprising the backdrop for the performance. The sound quality, crowd energy and musicianship were all on high gear, with each of the eight new songs incorporated into the set showcasing the wonderfully diverse flourishes Dulli continues to utilize in his music—everything from Middle Eastern, Funk and especially R&B sounds were present throughout the set, all laid behind the frontman’s distinctive and gracefully gruff vocals and grinding guitars. The band also ran through crucial cuts like “Gentleman,” “I’m Her Slave” and “Somethin’ Hot,” among others. Spoiler! 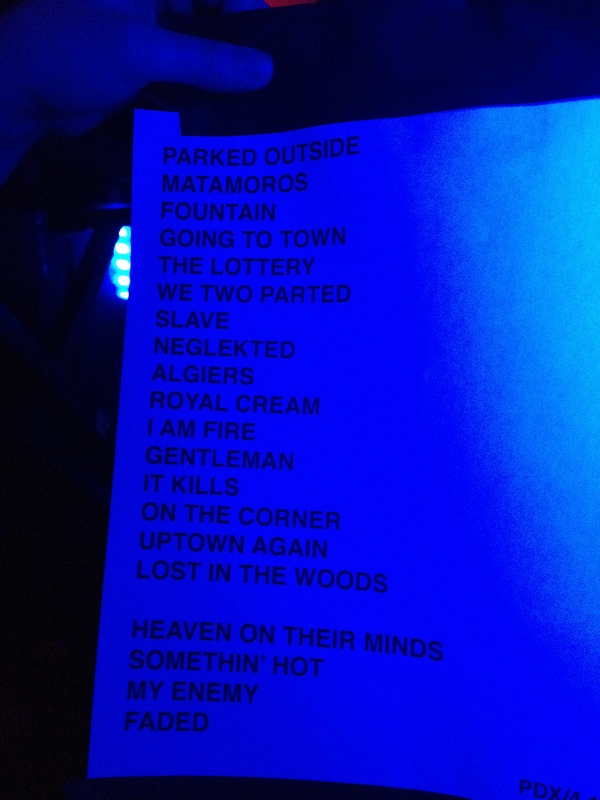 The Afghan Whigs’ set list last night. No other photography was permitted during the set. Although their set did not actually end there (the band came back on for a four song encore,) it was still one of the most perfectly orchestrated endings to a show I’ve seen this year—perhaps reminding us that the band’s appeal never really fell from grace, and that the already warmly received Do to the Beast simply marks a new chapter in the band’s outstanding catalog.